Systematics of Gastropoda: Informal Group "Lower Heterobranchia": Valvatidae. frontal part of the foot, the long snout and the feather gill! Valve snails are very small fresh water snail, equipped with a special feather-like type of gill the can extend from their pallial cavity. Possibly to clean this feather gill, valve snails also have a thread-like appendage at their disposal, the pallial tentacle. This as well they extend from their pallial cavity. The exact function of the pallial tentacle, however is not yet known. As only native prosobranch snail the valve snails are hermaphrodites. They have long tentacles at their head, which is prolonged to form a snout or proboscis. The valve snails' foot is flat, forked in the front and rounded at the back. Valve snails feed on detritus, decaying organic material. They themselves are an important food source for fish, which is why valve snails in German also are called roach snails or tench snails. Common valve snail (Valvata piscinalis). Picture: © Alexander Mrkvicka, Vienna. Description: The common valve snail's shell usually is globular with a narrow navel (umbilicus). Except for fine growth lines, the shell surface is rather smooth. Its colour is greyish white, yellowish or brownish, shining mattly. The narrow umbilicus may be open or halfway hidden by the apertural whorl. The aperture is almost circular and its rim is continuous. The operculum is horn-like and curved inside. It is structured in several spirals. As in many fresh water snails, the valve snails' shell form is very variable, depending on the geographic and environmental conditions. In lowland waters usually the normal form is present. Dimensions: H: 3 - 5 mm; W: 4 - 5 mm; N: 3 - 5. (Abbreviations). Habitat and Distribution: The common valve snail needs much oxygen, avoids humus compounds and so is threatened by the Eutrophication of many waters due to over-fertilisation. Often it remains dug into the sandy or muddy ground with only its tentacles and the feather gill showing. 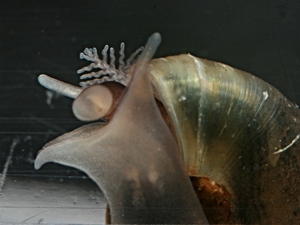 The valve snail then produces a flow of water for its respiration and nutrition. Also, Valvata piscinalis can be found crawling on water plants and wood. 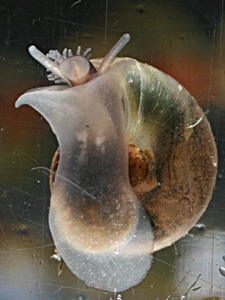 According to research by AUINGER and PATZNER (2006) in the Austrian Wallersee lake, the common valve snail especially prefers muddy substrates. There it was not found on stones. 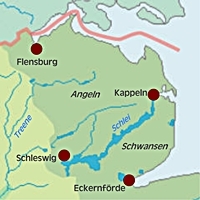 In Schleswig-Holstein, northern Germany, it was found in the Schlei, a brackish water branch of the Baltic Sea, with a prevailing salinity of 0.05%; the maximal tolerable salinity of the species is estimated to be 0.4%. The distribution area of Valvata piscinalis covers Europe and western Asia, where it usually is common. In some places, populations are in decline because of water pollution and may even be disappeared entirely. In Austria therefore the species is classified vulnerable (VU). In Alpine lakes and fast-flowing streams, there is a flatter subspecies with a wider umbilicus, the Alpine valve snail, Valvata piscinalis alpestris (Küster 1853). It may grow a little larger than the normal form, with a shell height of 5.5 mm and a width of 6.3 mm. Source: Wolfgang Fischer: Checklist of Austrian Mollusca.